Alright folks, Despicable Me 3 has to be one of Bella’s favourite movies (and mine) from this past summer! I may just love kids movies more than my kids do. I can recall when we took the kids to see Puss In Boots and they shhhh’d Steve and I. We were laughing so hard at some of the adult humour and the kids didn’t get it. The girls usually get passes at Christmas from my Aunt so we had some to use up when the movie hit the theatre. Of course I like doing things on a budget so will were mischievous like the Minions and snuck in some homemade popcorn. 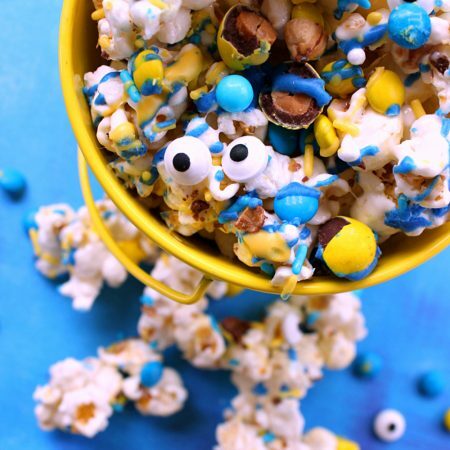 Not just any popcorn though, this delicious Mischievous Minions Popcorn! Now every time we watch the movie at home Bella asks for me to make her this popcorn. Everyone loved this sweet and fun mix! Watch those mischievous, fun-loving, goggled little helpers while munching on this incredible snack! Feel free to double the recipe or cut it in half to suit your family’s needs. Place half of the melted white chocolate into a separate dish. Using food colouring, dye one dish blue, and the other yellow. 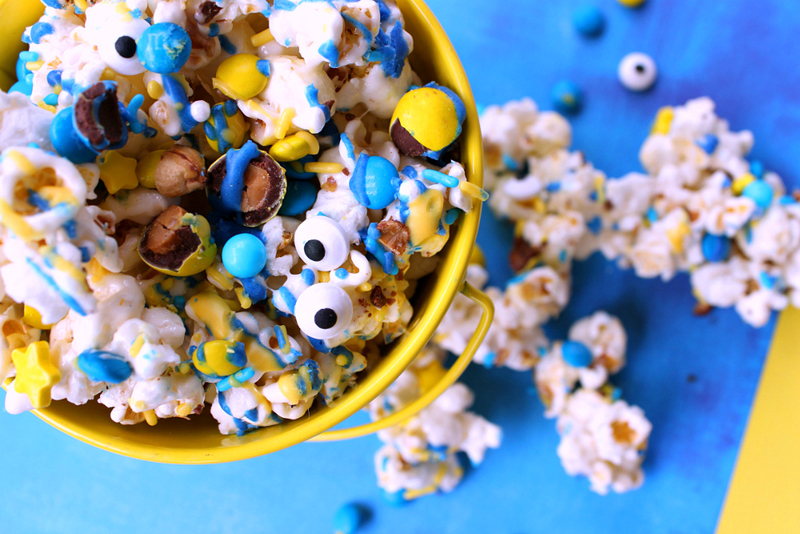 Add in some of the candy eyeballs, let set for 10-15 minutes, and enjoy your Mischievous Minions Popcorn! I also have an amazing Cars 3 popcorn recipe you should check out too! Who is your favourite character in the movie? Let me know in the comment section below! Oh so cute! Where did you get the candy eyeballs?